Members of the genus Bacillus has been documented to be versatile in metabolism, thus garnering a great amount of interest in studying and exploring its biotechnological perspectives. Nonetheless, marine Bacillus aquimaris outshoot for expedient candidature for the bioactive compound production but is not limited to: starch-degrading enzymes , proteases [2, 3], and organic solvent stable alkaline cellulases . We screened marine environment and isolated the beta haemolytic, moderately halophilic SAMM strain from Indian Arabian coastline sea water (17.24 N, 73.37 E) and exploited for antibacterial bio-surfactants. Here we presented the draft genome sequence features of the moderately halophilic SAMM strain. Since the type strain Bacillus aquimaris TF12 DSM 16205 was isolated from the marine sea, this moderate halophilic genome exhibited a range of proteolytic protein genes and new sub-family of alpha-amylases (GH13) reservoir . Moderately halophilic SAMM strain was grown on the nutrient agar medium with 1.5 M NaCl and was found that it can tolerate salts up to 2.7 M. Bacterial genomic DNA which were extracted, purified and sequenced following the protocol as described by Suryavanshi et al., (2017) . The 2×300 bp paired-end sequencing library was constructed using Nextera DNA kits and sequenced on the Illumina® MiSeq platform. A total of 1,366,666 paired reads were obtained. Sequence quality of the genome was analysed for quality control using FastQC software . The reads were trimmed, and only the bases with quality above 20 (Q20) were used for assembly. After analysis, raw sequences were trimmed and assembled using de novo assemblers SPAdes 3.6.1 . The obtained contigs shorter than 200 bp were eliminated. Annotation and identification of metabolic pathways encoded on the draft genome was carried out using the NCBI Prokaryotic Genome Annotation Pipeline (ver3.3, released 2013) (Available at https://www.ncbi.nlm.nih.gov/genome/annotation_prok/) was used for annotation refinement and registration of the genome at the International Nucleotide Sequence Database Collaboration (GenBank, USA) . The de novo genome assembly of strain SAMM resulted in 161 Scaffolds with a genome size of 4,414,932 bp and G+C content of 44.8%. A total of 4,247 protein-coding sequences (CDSs), 123 copies of RNA: 32 rRNA, 86 tRNAs and 5 ncRNA were identified. Protein coding genes were analyzed by COG database  using COGsoft  and Pfam domains were predicted using NCBI Batch CD-Search Tool . We obtained 3199 total number of COGs assignments under different classes. In addition, using the RAST server version 2.0 , annotation based strain SAMM metabolic profile distributed in 453 subsystems. Bioinformatic analysis suggested SAMM containing 106 stress response genes, out of 12 sub-categorized for osmotic stress which codes for Choline and Betaine uptake and Betaine Biosynthesis, 28 genes related to oxidative stress, 6 were observed for cold shock and 18 involved in heat shock which is extended dnaK gene cluster. It also possesses the genes clusters for secondary metabolism such as thiazole/oxazole-modified microcin (TOMM) synthesis and auxin biosynthesis. The 17 genes are associated with the acquisition of Iron and their metabolism, out of which 14 codes for siderophore biosynthesis. The SAMM encoding many genes for membrane transport system (123) including 32 for ABC transporters and 12 are related to Uni-, Sym- and Antiporters. Being marine moderately halophilic, the molecular functionality of the bacterium in the osmotic environment carries osmoadaptive glycine betaine synthesis genes . These were found to be annotated in MINN01000074, MINN01000096 and MINN01000106 accessions along with the stress responsive osmoadaptive ectoine/hydroxyectoine ABC transporter ATP-binding protein cassette under MINN01000011 accessions. Interestingly, SAMM harbours the complete synthesis cluster for polyamine spermidine. Polyamine-spermidine is recognized as a natural cardio-protectant and providing an economically viable natural source in contrast to the chemical synthesis . This bacterium has elongated rod shaped morphology (Figure 1) and having spores generation and Mn (II) oxidization genes were found as similar to its close relative Mn (II) oxidizing marine bacterium Bacillus sp. SG-1 (RAST server Genome ID 161544.4) . Various reports describe the presence of large scale and widespread biological compounds showing the abiogenic and surfactants phenotypes in marine bacteria . Since the strain SAMM showing the bio-surfactant activity phenotype, molecular basis of the origin of this activity is still elusive. The SAMM genome displaying the enterobactin siderophore production transporter (Iron-enterobactin transporter, ATP-binding protein) may be associated with the surfactin molecule synthesis pathway . Scanning electron micrograph of Bacillus aquimaris SAMM MCC 3014 describing the rod shaped morphology. 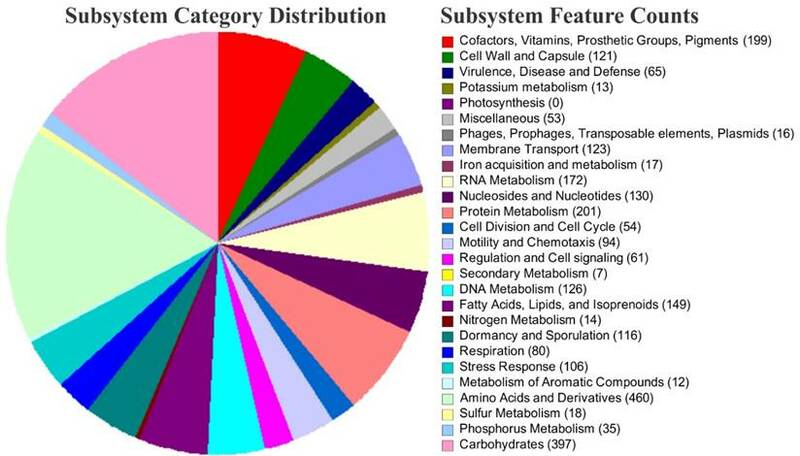 The overview of subsystem category coverage Bacillus aquimaris SAMM MCC 3014 genome based on RAST server. Bacillus aquimaris strain SAMM has been deposited at Microbial Culture Collection, National Centre for Cell Science Pune, under the accession number MCC 3014. This whole-genome shotgun project has been deposited at DDBJ/EMBL/GenBank under the BioProject ID PRJNA341790 with accession number MINN00000000. The version described in this paper is in the first version, MINN00000000.1. MS acknowledges Council of Scientific and Industrial Research, New Delhi, for fellowship. Authors are thankful to Dr. Yogesh Shouche and Microbial Culture Collection project staff (BT/PR10054/NDB/52/94/2007). Authors are thankful to Dr. Shashi Ghodake, DDS, Middletown, CT 06457, USA for proofreading of the manuscript.